Yvette Highsmith-Francis, director for CHC sites in Hartford. County started reading the poem, “A Boy in Blue”. 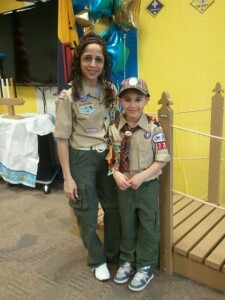 We pay tribute to our Cub Scout tonight. Around her, a couple dozen cub scouts from Pack 732 in New Britain listened on. It was there day. Some were moving up from Tiger to Bear, others were moving on to Webelos, or to Boy Scouts. Better citizens than you and me. Also looking on was Yaritza Mendez, a Receptionist at CHC in New Britain, the Assistant Cub Master for the Pack, and the mother of one of the boys moving on to Webelos. 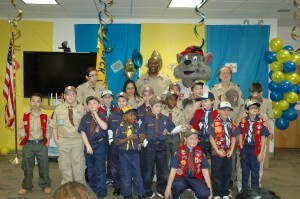 It was the second year that the Pack celebrated its Blue and Gold Banquet at CHC’s New Britain site. Yaritza’s son, Keiden Acevedo was proud of his mother for the great work she does here at CHC and for the work she does with the Cub Scout Pack. An important part of scouting is to “leave no trace”, to clean up and leave a place at least as nice as you found it, so Keiden urged his fellow scouts to be diligent in cleaning up after the banquet. The scouts had earned their First Aid merit badges at CHC. They had learned about disinfecting wounds, applying bandages and ways to help avoid the spread of infections. They took their first aid supplies on their camping trip. They participated in a block party at CHC. CHC is a Patient-Centered medical home providing leadership in primary care. Many of the scouts and their families are patients, either at our site in New Britain or at some of the school based clinics we have in New Britain. We focus on keeping patients healthy, so that they don’t need additional medical care. The focus on being patient-centered goes beyond the appointment. It includes helping members of our community find ways to live healthier lives. It fits very well with the goals of cub scouts and their leaders. Yaritza Mendez’s work, both as a receptionist and as an assistant cubmaster is a great illustration of CHC employees taking good health beyond the appointment.